The puppets, which are created at the Yagisan-workshops, were invented by Machiko Watanabe of the puppet theatre PUK, located in Yoyogi. The puppet theatre PUK does not only make stage performances but has also already provided its characters to the TV or movies. In the year 2007 Mrs?? Watanabe showed her cute handmade newspaper-puppets during the ‘Konomoto Exhibition’ in the rooms of the ‘OZONE Living Design Centre’ in Shinjuku for the first time. 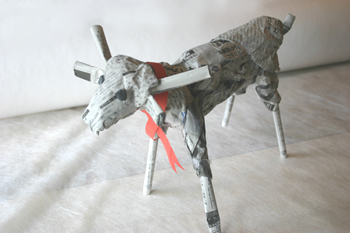 I took part in the ‘Let’s make puppets out of newspaper!‘- workshop which was also held at that time, learned how to make these puppets and because I really liked it, I kept on creating afterwards. ‘Start with making the bones, then attach the meat.’ This method is the base for the carving and the design. At the same time you to have think carefully about the shape of the animal you create. It’s easy for adults and kids at the same time, and afterwards you have a wonderful puppet, which will never become boring. So we are very happy that we can use the manufacturing skills invented by Ms Watanabe for the newspaper-puppets of our ‘Yagisan’-workshops. And if we have the opportunity, we would like to invite Ms Watanabe, the founder of the idea, to hold a workshop together with us.